This quilt was made specifically for Gene, who is the most wonderful and loyal friend anyone could ever hope for. In any case, one of the quilts in the gallery section of the book was a simply wonderful variation of Courthouse Steps, entitled "Burning the Midnight Oil". It looked (at least to me) like a series of cascading Chinese lanterns. I decided that this was the perfect layout to make a quilt for my friend, Gene. I eventually made it from 8 different red-to-yellow orangey prints and 4 different shades of black/grey. Each column has a tassel hanging from the last lantern. This quilt was constructed using a method known as 'quilt as you go'. 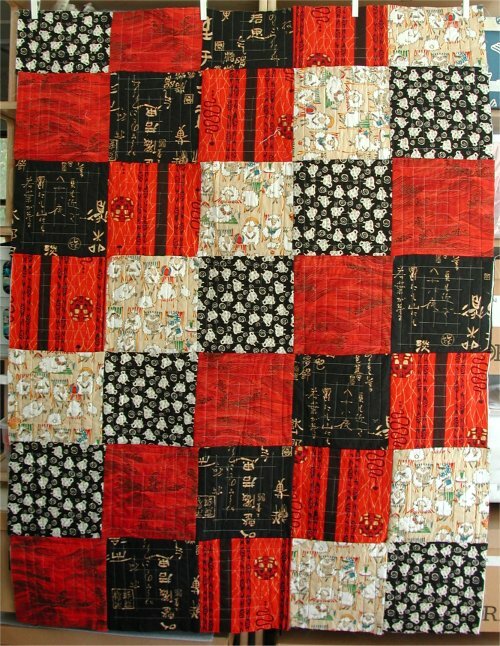 For this method, each block is sewn as a mini-quilt: the top fabrics are sewn through the batting and backing so that when the block is completed, it is also fully quilted. Rows are formed by sewing together the fronts of the blocks, while the back edges are hand-sewn down to conceal the raw edges. Each row is joined to another row in the same manner. The 2 borders were added and quilted. 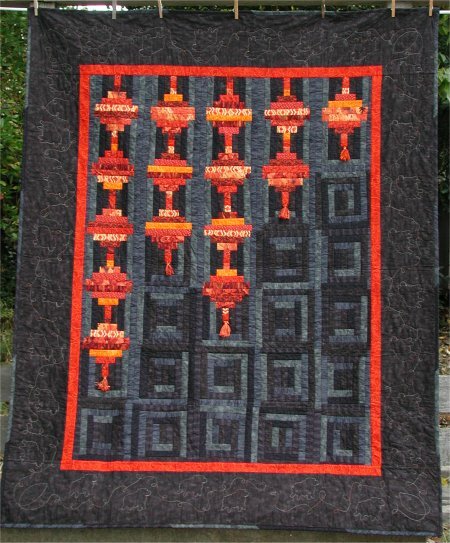 The binding is made from the different blacks used in the front of the quilt. However, life is never simple. 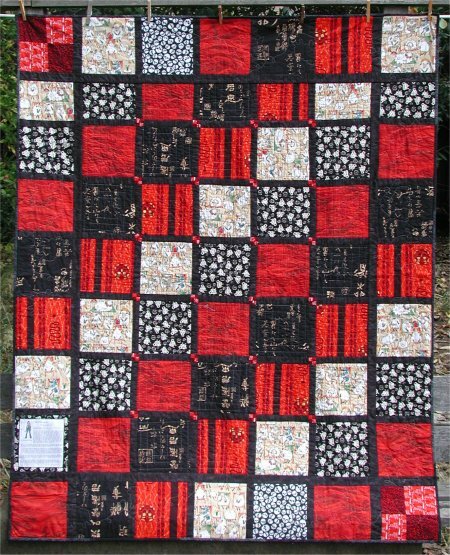 I had been collecting Asian-themed and non-juvenile sheep motif fabrics for the idea of this quilt for several years by attending quilt shows and haunting fabric stores. I had no specific pattern in mind when buying the fabric, but when I found these specific motifs, I bought "some". The red/white fabric used in the 4-patch intersections and in the corner blocks is from Europe and actually portrays a shepherd with his sheep! How could I resist it? :-) It wasn't until I actually got *around* to finalizing the design (with this Courthouse Steps layout) that I realized this original fabric I had chosen throughout the years wasn't going to work .. but .. I still needed to use it. Since I was doing the front in a quilt-as-you-go style, I decided to use the original fabric as the back of each block. Inevitably, I further complicated matters by deciding that, in order to make it look like I had planned it that way, I made sure the backing blocks formed a pattern of their own. This is a picture of the back of the quilt "before". Read on to see how it actually turned out. Did I mention that life is never simple? As I was hand-sewing the back of the blocks together, I was discovering that I wasn't as accurate as I thought I had been during construction. In fact, I was creating a major screw-up: the intersections of the blocks were not lining up. If the fabric on the back of the blocks had been a solid, it wouldn't have made a real difference because your eye wouldn't have noticed the discrepancy. However, since all of the fabric I was using for the backs were prints .. all very different, highly contrasting prints ... this mis-alignment of the intersections was a glaring error. This simply had to be corrected .. or disguised. Re-doing the blocks was out of the question, but I actually came up with a useable work-around! To disguise this major screw-up, I decided that I had to add sashing around every block. I must admit, I think it looks rather dramatic ... and who would figure out that it was only an act of desperation that caused the sashing to be used? In November 2004, I was very self-indulgent and bought a Janome 300e embroidery machine. 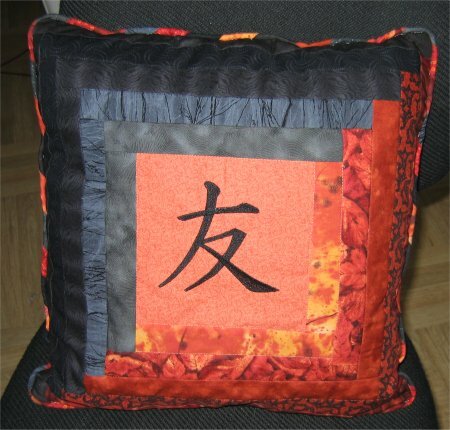 During one of my subsequent frenzied embroidery motif download sessions, I happened to find a Kanji motif that is supposed to mean "friend" (at least I really hope that it does! ).